Keyscape is an extraordinary new virtual instrument from acclaimed developer Spectrasonics, which features the largest selection of collector keyboards in the world. From "holy grail" pianos to stunning keyboards you didn't even know existed, this is a keyboardist's dream come true! Ten years in the making, each of these rare, sought-after keyboards was carefully restored and then deeply multisampled by the renowned Spectrasonics Sound Development team. After going to the ends of the earth to find each one of these special and incredibly rare instruments, they rebuilt them to optimal condition with the top technicians and expert craftsmen from each discipline. They even went as far as spending years redoing these instruments from scratch again and again until they were totally "right"! This incredible attention to detail and meticulous care given to each instrument allowed them to develop these sounds to a whole new level of authentic tone. These compelling and highly expressive unique sounds will inspire you to PLAY! 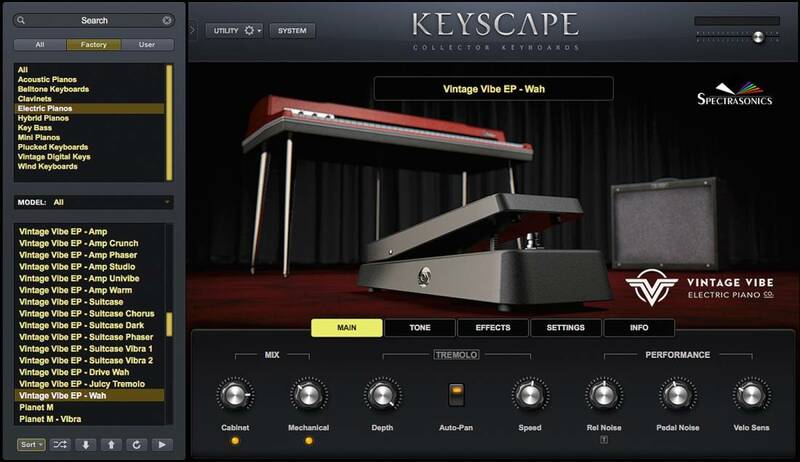 While it's every performing keyboardist's dream to have the very best instruments available anywhere, Keyscape is equally useful for producers/remixers/composers as well, since these instruments can be easily transformed into amazing new unheard of sounds with the powerful STEAM Engine under the hood. 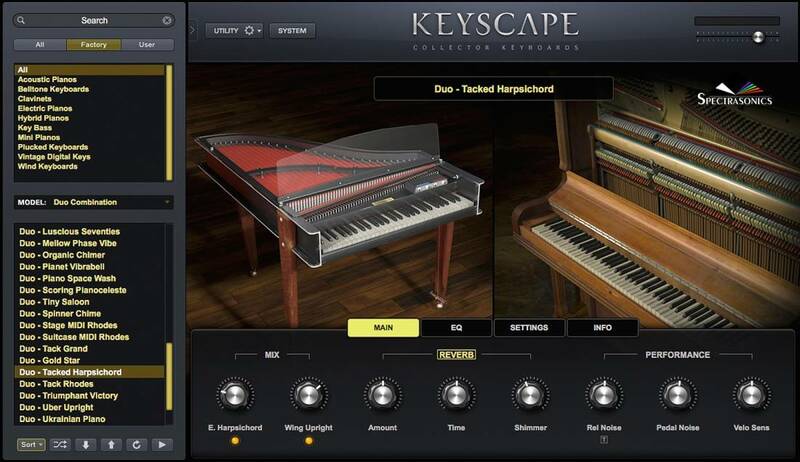 This sonic transformation capability means that Keyscape can also easily turn these incredible instruments from History into innovative sounds of the Future! With many of these collector instruments, it's really the imperfections that make them so interesting. Instead of cleaning up all the quirks and noises they make, we made sure to closely capture them since they are big part of their vibe. In addition to that, the Spectrasonics software team closely modeled the authentic behavior and mojo of vintage amplifiers, classic effects units and unique subtleties like mechanical noises, pedal noises and release overtones to bring these sounds to a whole new level of authenticity and dynamic expression. As a bonus for Omnisphere 2 users, Keyscape also integrates fully as a satellite instrument within the Omnisphere interface. Keyscape will simply appear as a library inside Omnisphere's browser for users of both plug-ins. Not only is it a significant expansion of new patches and soundsources, this capability really allows Omnisphere 2 users to harness the full synthesis power of the STEAM Engine to explore endless new sonic possibilities and combinations! Keyscape now also includes this cutting-edge library of over 1,200 patches specially designed for users who also have Omnisphere 2. The richly detailed keyboard sounds of Keyscape have been dramatically transformed using Omnisphere's deep synthesis capabilities. These truly amazing patches offer an extremely wide variety of incredible sounds for modern music producers. 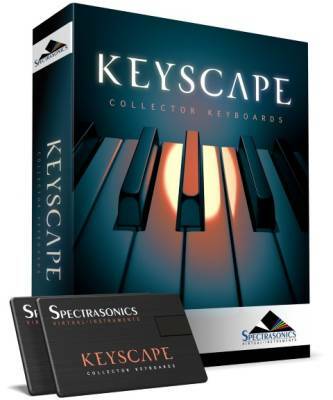 Please visit www.spectrasonics.net/keyscape for full sound listings, audio demos and system requirements. • AU, VST 2.4, AAX, as well as a standalone application. • VST 2.4, AAX, as well as a standalone application. *32-bit hosts are not supported for Keyscape. 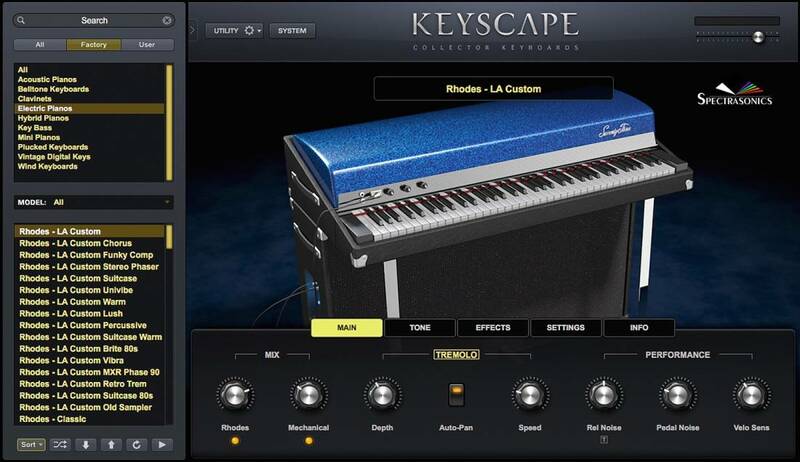 However, Keyscape sounds can be played within Omnisphere 2, which can operate in a 32-bit host. This takes piano vsts to another level. It feels like I have a piano in my room! Expensive but worth every penny. I have a 2009 iMac and it works perfect. I have also tried NI Giant, Gentlemen etc. Keyscape is on another level. I also like that it works in standalone.